This product should be in stock on Wednesday 17 July, 2019. The Super Sprouter™ Simple Start™ Micro Greenhouse Kit is great for smaller projects. Ideal for separating plant or seed stock. This kit includes an 8 inch x 12 inch grow tray, 24 site tray insert pre-filled with Grodan Macro plugs, a 4 inch ultra clear humidity dome with adjustable vent and the Super Sprouter™ Art of Propagation booklet with expert growing tips. 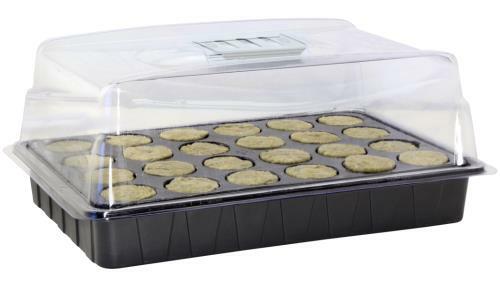 This product is great for small spaces or you can fit two on one Super Sprouter Seedling Heat Mat®. Make it simple with the Simple Start™ Micro Greenhouse Kit.